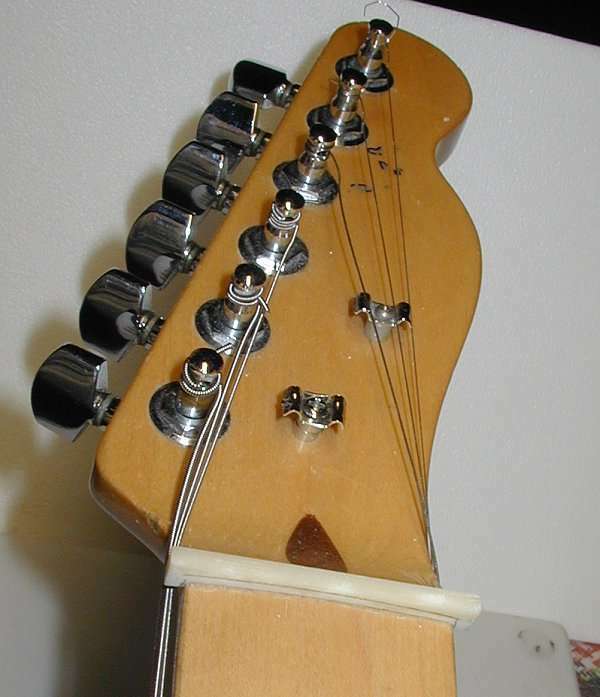 This is a Warmoth "vintage construction" Tele neck, with a 7-1/4" fretboard radius. The truss rod is single action with a heel-located slotted nut. 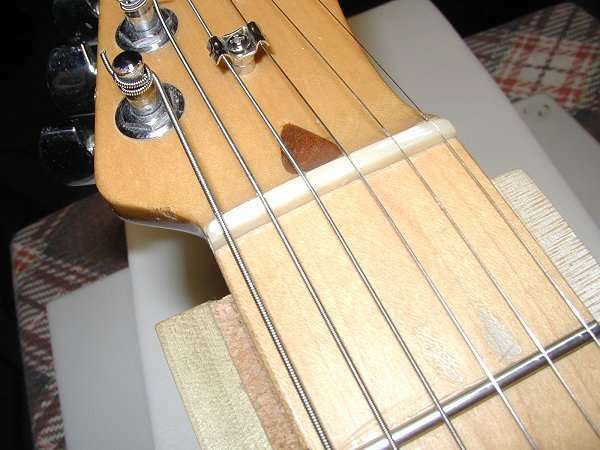 The old frets appear to be Warmoth #6230, with a crown width of .080" and a .043" crown height ... typical modern Fender frets. 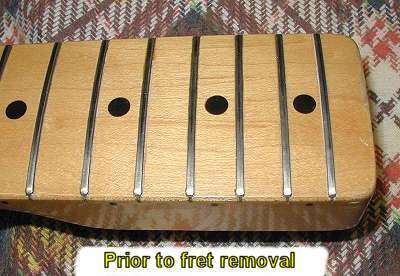 Some first and third position frets (the "cowboy" and "blues" positions) have deep string divots, while most of the frets from the 1st to the 10th show increasing wear as the rounded fret crown were worn flat and smooth. The concern is with the divots - a few were so deep that a level and crown would have been impossible. Time for a refret on this ol' bad boy! 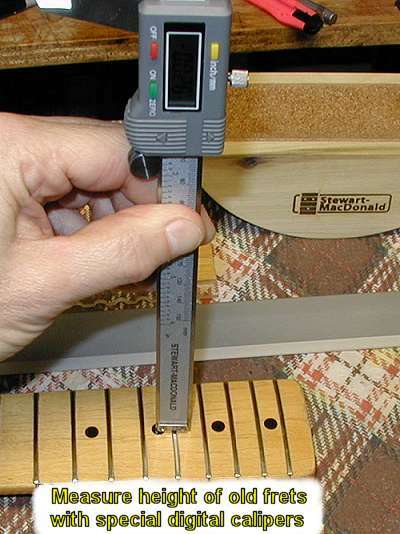 Though the fret crowns measured an average of .026" high off the fretboard, in reality they average .041" in height. 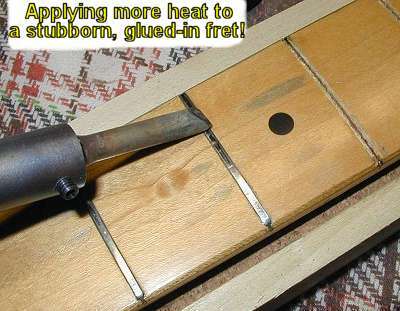 This is because of the fingerboard lacquer buildup - the fingerboard and frets are sprayed after the initial fretting. 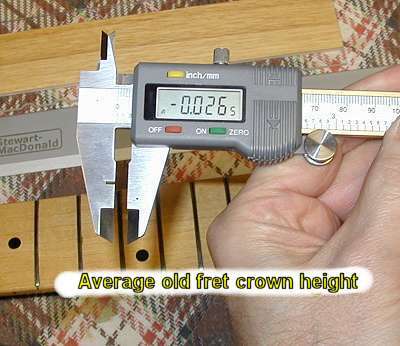 The old frets average .079" in crown width. 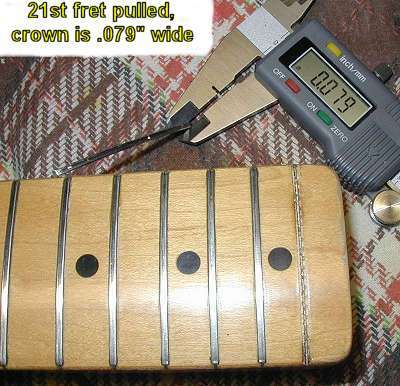 I'll be using Stew-Mac #0141 frets with a crown that's .095" wide and .045" high. 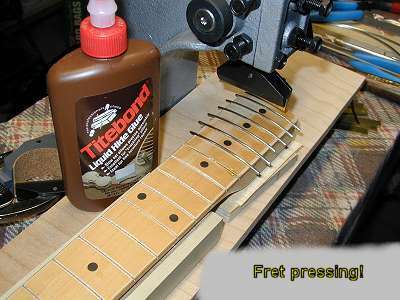 Warmoth glues and presses in their frets (as do most manufacturers these dayze). Usually they use a CYA glue, sometimes alphatic resin or hide glue. 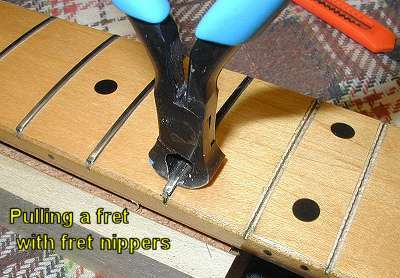 These frets were WELL glued and it took lots of heat to loosen the bond enough to get the fret nippers under the fret crown and lift them out without the fret tang barbs sticking and/or chipping off the fingerboard. 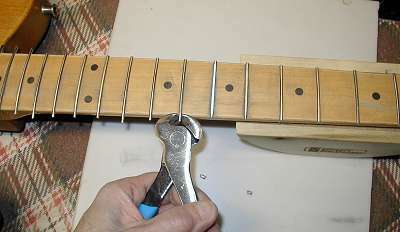 The fingerboard must have the lacquer "walls", that are next to each fret slot, knocked down flat. Sometimes just a leveling file is all that's needed. 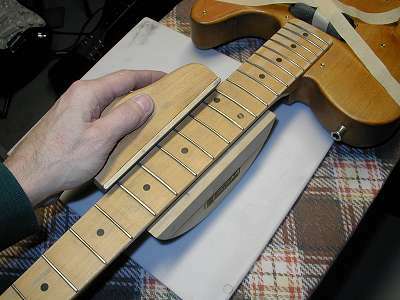 This fingerboard was a bit off in the radius, so it needed to be sanded - here I'm using a 7-1/4" radius block and 600 grit Klingspor abrasive paper to get the job done. 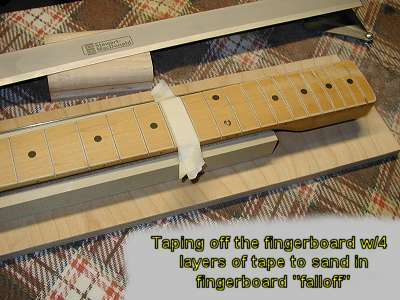 It's quite common for the fingerboard neck in the heel area to swell up and "hump" - sanding in a few thousands of tapered "falloff" means there won't be any buzzing or action issues somewhere down the playing road. Using the 600 grit Klingspor paper again. 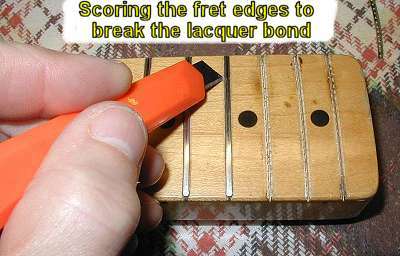 After sanding the board down, and cleaning out the slots again, I use a little triangular file to lightly chamfer the edges of the fret slots, to help ease the fret tang in smoothly - sorry, forgot to get a pic of that! A pound sleeve of Stew-Mac #0141 nickel/silver frets (.095"x.045") - they're a straight 2 feet long and need to be curved before cutting and fretting. 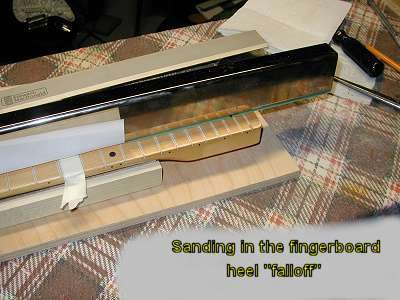 Here's a 2 foot fret length that's been curved using a Waverly fret bending jig - the first and last inch don't get bent and either need to be hand bent or cut off. 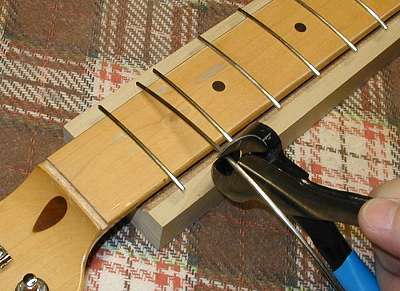 Cutting a fret to length using special fret cutters. I usually do an overhang of between 1/8" and 1/4". 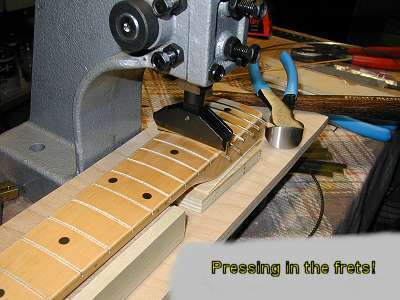 ... using an arbor press with a 7-1/4" radius brass caul - this seats the middle area of the fret, as well as compressing and pushing the fret ends outward, towards the slot ends. 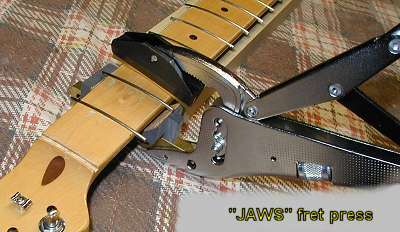 This very slightly drives the fret barbs sideways, for better "bite" in the slot. 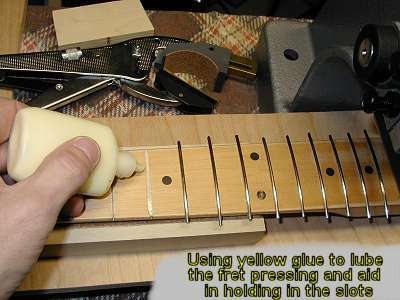 I usually use either a liquid hide glue or an aliphatic resin yellow glue (Titebond) to both lube the fret pressing and to aid in keeping the fret stuck in the slot - basically, the glue forms a "dam" around the fret tang barbs. I mostly prefer the yellow glue. 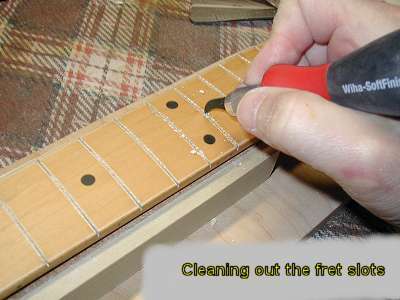 Sometimes I'll wax off the board and use thin CYA along the edge of a fret that's just been pressed in, followed by a piece of paper towel with acetone to clean any run-off. I give the glue at least a few hours to set up before moving on to clipping and leveling - probably best to leave it alone overnight ... no need for rushing here. Ready to level, clip, crown and polish. 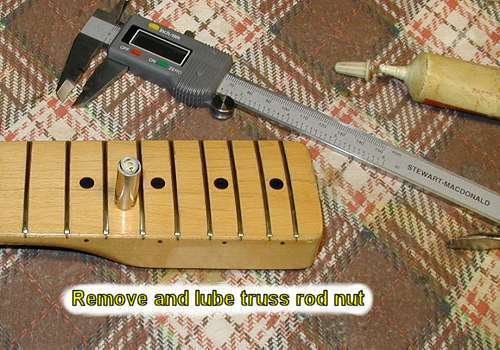 Tweak the truss rod to get the fingerboard level. 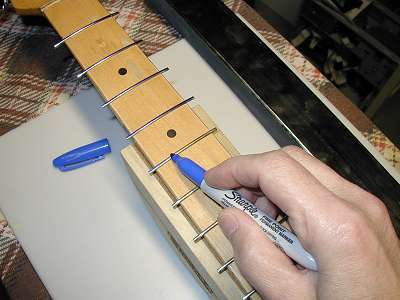 Color the fret tops prior to leveling. Leveling with a short 11" level and 320 grit. Leveling with a 24" level and 600 grit. 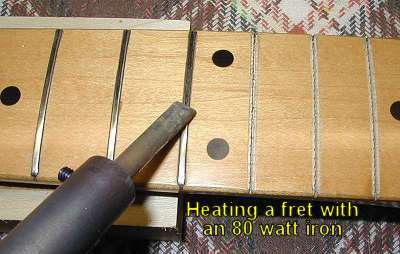 Nipping off the fret ends. 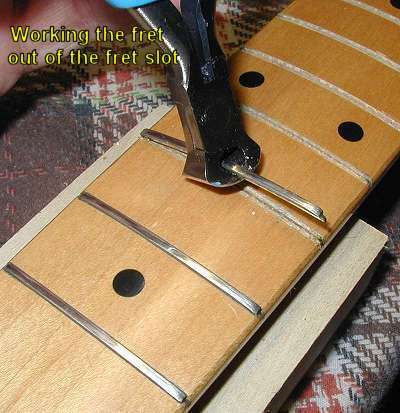 Filing the fret ends smooth and to a slight angle. 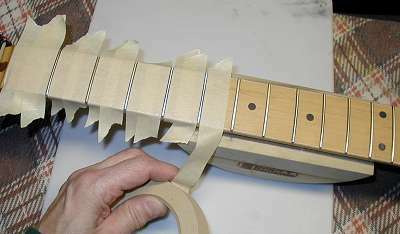 Masking off the fingerboard prior to crowning. 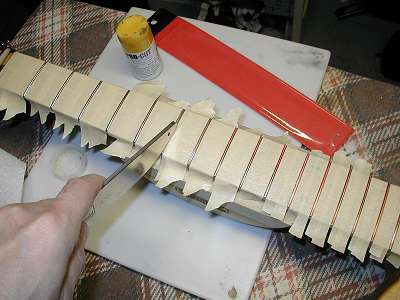 Coloring the flat fret tops prior to crowning. 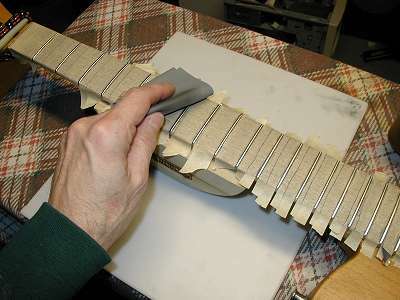 Crowning the fret tops using a 300 grit diamond concave file. 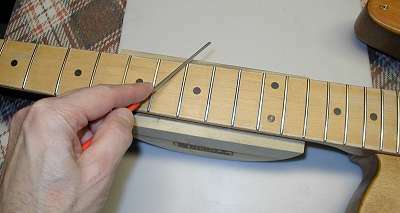 Buffing the fret tops - 600 grit through 6000 grit. Ready for a lacquer sprayed finish. Nutless! This is the one piece maple Warmoth Tele neck that I'd just completed doing a refret. 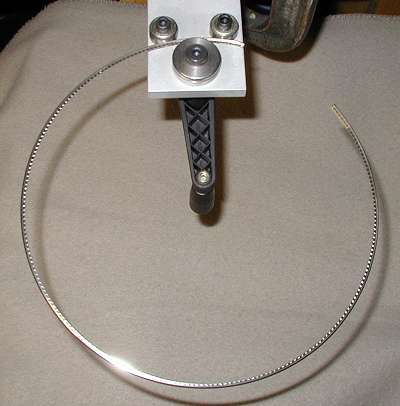 Strung up with .010-.046 strings, the nut will be cut with slots that'll accept up to .011's. A vintage, unbleached cow bone nut. These blanks come in a rectangular format and I'd shaped in 7-1/4" radius (same as the fretboard) to match the curved nut slot. It took a little bit of face and back sanding (using 120 grit paper on a flat piece of marble tile) to get the nut to fit firmly into the nut slot. 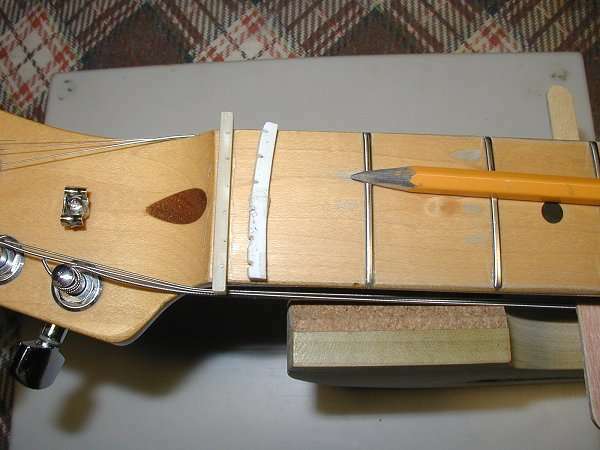 I used a half pencil (see the next image), laid on top of the first two frets, to scribe what will be the absolute low point of the nut slots. I used the old plastic nut blank to mark where the slots will go on the new bone nut. There's the half pencil - it's just a number 2 pencil that's been sanded flat on one side by a disc sander. 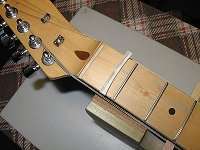 It's laid flat on the frets (as you see in the above image), and moved side to side on the fret tops while marking the face of the nut. Nut files! 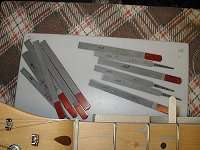 Here, I'm selecting the following file widths - .056", .040", .035", .028", .016", .013" - these files will create slots that will work with most .009" through .012" string sets. It's easy for a fine cutting nut file to bind in such narrow slots, so I use a file lubricant called "Pro Cut" to aid the cutting process. 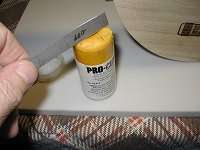 This lube does a great job of making for a smooth, chatter-free cut, and it prolongs the life of the files. Carefully start each slot with a few strokes of the high "E" string nutfile, then go over slots 2 thru 6 with the "B" string nutfile, the go over slots 3 thru 6 with the "G" string nutfile, etc. When all six are started, pop in the strings and wind'em up to concert pitch. 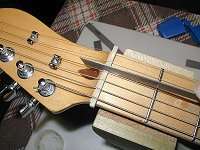 Working on one slot at a time, the string is de-tuned a few peg turns, and pulled out of the slot, and the filing commences. The file cuts on both the forward and backward stroke. 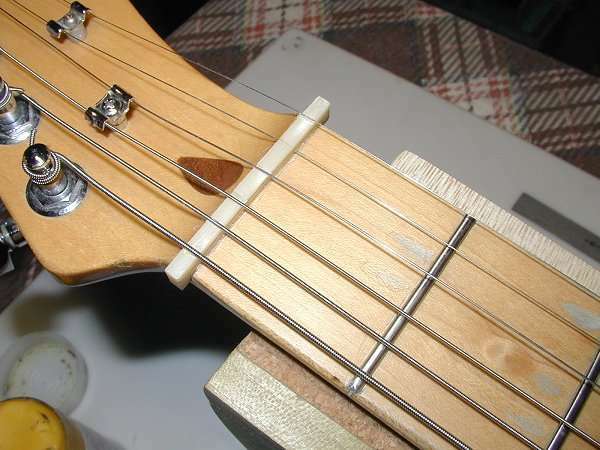 The file is slightly angled down, toward the tuners - this is important, as it's the front edge of the nut that must be the breakover point of the string. 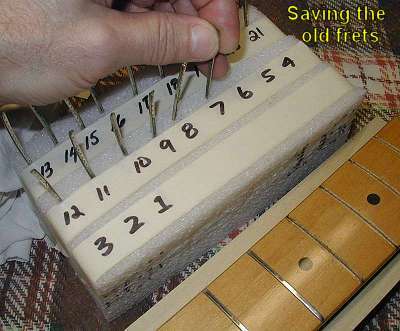 After every 1/2 dozen or so strokes, I'll clean the slot, put back the string, tune it to pitch and test the nut relief (the distance between the bottom of the string and the top of the first fret, when that string is depressed between the second and third frets). I shoot for a very tiny nut relief gap - somewhere between .005" and .010" - usually a bit more for non-locking trem guitars. All done! 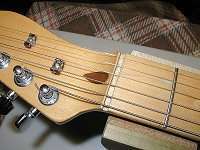 Once the slot depths are cut satisfactorily, the nut is positioned to afford the best string clearance on both "E" strings. Then the nut is sanded on either side, to fit perfectly centered in the slot. And a final buffing with 100 thru 400 grit polishes it up. .... roll! Well, almost - now this neck just needs to get clear coated. Eight light sprays of Guitar ReRanch tinted clear. I'll give a week to start the cure and then bolt it on the body and set it all up for best playability. I'll use some 0000 steel wool to polish off the lacquer on the frets.